John Mayer was at the famed Budokan arena in Tokyo on Wednesday night (April 10) where he welcomed fellow singer-songwriter and guy with a guitar Ed Sheeran during his performance. As Jambase reported, Sheeran hung around in the Japanese capital after his show at the Tokyo Dome on Tuesday to sit in with Mayer, who was closing out his spring tour of New Zealand, Australia and East Asia. After Mayer introduced Sheeran as “one of the most talented artists I know in my life,” the two songsmiths kicked off the collab with Mayer’s “Belief” from his 2006 album Continuum. The singers traded verses and came together to harmonize on the choruses. Next up was Sheeran’s Grammy-winning smash hit “Thinking Out Loud” from his 2014 album x. As Jambase pointed out, the two singer-songwriters had jammed on the song before at the 2015 Grammys with Herbie Hancock and The Roots. 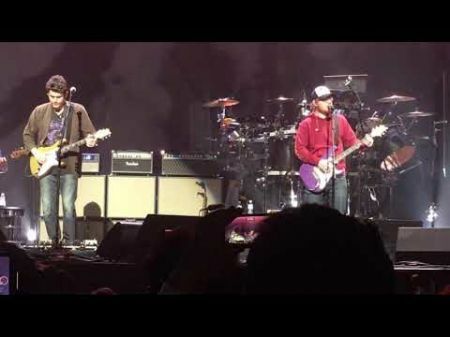 For the Tokyo show, Mayer reprised his role as lead guitarist, delivering an incendiary solo. You can watch both performances in the video above. John Mayer returns to the States this summer to tour with Dead & Company including the band’s two-night tour closer at Folsom Field in Boulder, Colorado. Click here to purchase tickets. Mayer is also set to headline the Jazz Aspen Snowmass Labor Day Experience on Aug. 31 in Aspen, Colorado where he will welcome fellow singer-songwriters ZZ Ward and Luke Combs. Purchase your (Tickets) here.